OPINION: Walking the Walk | Back Page | Style Weekly - Richmond, VA local news, arts, and events. In a 1989 photo from the Richmond News Leader, Thomas Jefferson High School students Toby Billowitz, Corey Powell, Alisa Cartledge, Lori Barnes, Folake Carter, Vanice Toler and others take their fight to Save Our School to Richmond City Hall, where they prevailed. 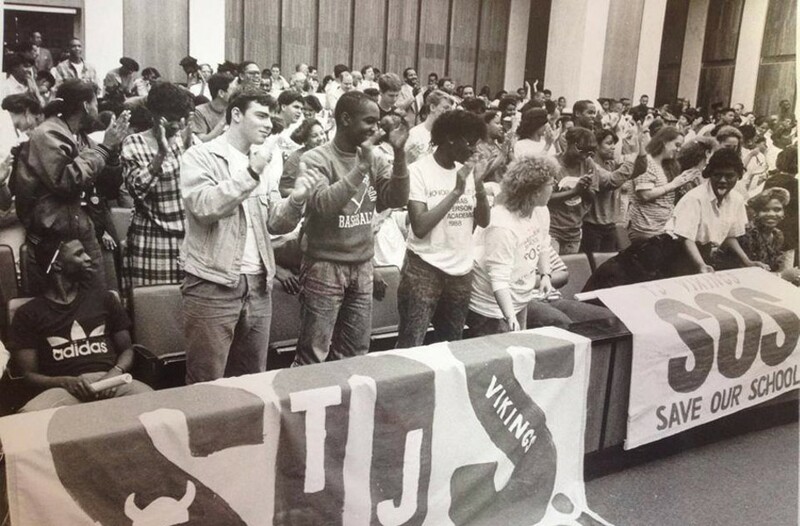 Thirty years ago, on March 22, 1989, the entire 700-plus Thomas Jefferson High School student body walked out. Members marched the nearly 4 miles from their school, east on Broad Street, to Richmond City Hall to fill the School Board chambers and make impassioned speeches. It was 25 years after the first black student, Daisy Jane Cooper Johnson, integrated TJ, which opened in 1930 as a whites-only high school. The school's website credits "the students who were denied admission during the days of segregation [who] rallied their classmates, alumni, and other members of the community, then marched … [convincing] the school board to keep the school open." The reasons Thomas Jefferson was on the chopping block still resonate today: declining enrollment, lack of funds and lack of buy-in from white people in the city. The school wasn't the only one in jeopardy: Six other Richmond Public Schools were proposed for closure to save the system about $8 million. Faded photos of the marchers capture the energy emanating from the students holding the Save Our Schools movement banners. These emotions still bolster the memories of those teens who today are professors, artists, hair stylists and doctors. When TJ alumnus Toby Billowitz posted a clear image of students applauding in the chambers, on Facebook a few years ago, his former classmates responded emotionally. "A day I will never forget," wrote Karen Goode. "A very proud moment … GO VIKINGS … Almost makes me cry"
"Love it!" added Nsenga Burton, a class officer and one of the speakers that day at the School Board. "We stood up for our school and won!" Alumna Lisa Anderson Kearse recalls a hard-working, harmonious vibe at the school: "We were like brothers and sisters," she tells me. "All of us hung out." Weeks of planning went into the march. Parents like Judge Harold Marsh and Beverly A. Burton, Nsenga's mother, helped the students quietly organize the protest to prevent putting their teachers' jobs in peril. Back then, TJ had a reputation as a home of high achievers, with stellar boys' and girls' basketball and track teams that sent students to competitive colleges. The plethora of activities included Key Club, drama, debate, newspaper, forensics and student government. By 1989, the students and parents had built up the school resources and identity, including fundraising for new band uniforms, after the West End high school was merged with others in the early 1980s to save funds as the population plunged because of white flight after integration. "I know that Thomas Jefferson High School has only 800 students attending, but if there were not so many people in the West End who think that their children can only receive a good education at private schools, we would not have this problem," wrote Rachel Abbey, who was an 11th-grader at the time, a sentiment that rings true today. Alumna Burton, who now is co-director of the film and media management concentration at Emory University, recalls, as a black student, often feeling the aggression of neighbors who shouted slurs to black students who stepped on their lawns and the same sentiment on talk radio airwaves. But, she says, there was no animus among the students. As a parent of a current Thomas Jefferson High School student, looking at the heroic activism of 1989, I see parallels in the students' struggle against disinvestment in our public schools on a federal, state and local level. This past year, the school that is "accredited with conditions" by the Virginia Department of Education has experienced many ups and downs. Helpful neighbors, parents and community members painted long-neglected bathrooms. System and school staff devoted hours to rectify miscalculated grade-point averages and incorrect class credits. The basketball and robotics teams distinguished themselves in their respective competitions. The Parent Teacher Student Association met monthly with the administration to plan ways to support the school. During the General Assembly, teachers and families joined the large-scale protest for full funding from the state. The International Baccalaureate program students wrote long research papers and seniors are receiving college acceptances. But the school's teachers have constantly needed to raise money for supplies and even furniture. And the Richmond Public School district was coursing through an emotional budgeting season that shows dramatic cuts for extracurricular activities and other services at Thomas Jefferson. Could the rezoning discussion negatively impact the school again? In a time of demoralizing conditions at Richmond facilities and with competition from private and test schools, the Save Our Schools struggle from 1989 offers inspiration. Burton warns parents and students today to steer away from apathy. Instead, she urges Richmonders at all levels to create a sense of awareness and community. Her advice: "It's hard to close a school when it's in the news." But activism doesn't stop with marching. It needs a concerted and sustained effort by students, parents, teachers and administrators. Neglecting, defunding and closing schools are easy ways to save money, while demoralizing everyone such actions touch. Funding education is not a drain of current resources, but an investment in our future. Dina Weinstein is a Richmond-based writer and Thomas Jefferson High School Parent Teacher Student Association vice president of membership. Her son is a 12th-grader at Thomas Jefferson in the International Baccalaureate diploma program and is co-captain of the robotics team.